Our friend Big Michael is a yoga instructor for Pure Yoga, a Hong Kong based chain. 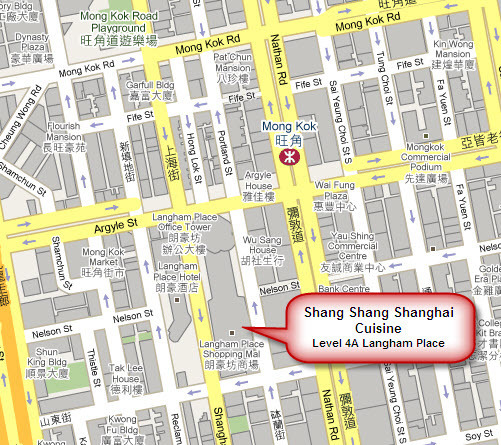 He’s been teaching for several years, primarily at the Langham Place location in Mongkok, Kowloon. As Tawn is an active yoga practitioner and has even considered becoming an instructor, he wanted to attend numerous classes during our vacation. Michael arranged for Tawn to have a guest pass and so Langham Place became a frequent destination during our trip. Mongkok used to be the heart of the dark underbelly (mixed biological metaphors) of Hong Kong, home to the red light district, gambling dens, and the base of the Triads’ operations. In Hong Kong popular culture, movies such as Portland Street Blues immortalized the nefarious underworld of Mongkok, where the allegiance of gang members and police officers was always suspect and subject to double- and triple-switches. These days, however, Mongkok is much cleaned up. The building of Langham Place, a large office, mall, and hotel complex, has transformed the neighborhood into a seemingly respectable district with bright lights, clean sidewalks, and plenty of legitimate business. Of course, “cleaned up” is as much a cosmetic matter as a systemic one. Walking back to Langham Place from Yau Ma Tei just before dinnertime one evening, Michael and I were accosted by a number of touts trying to sell us women from a range of nationalities: Thai, Filipina, Indonesian, Chinese… I will say, though, that these activities were much more subtle than, say, Soi Cowboy in Bangkok, even if we were just a block away from the mall. 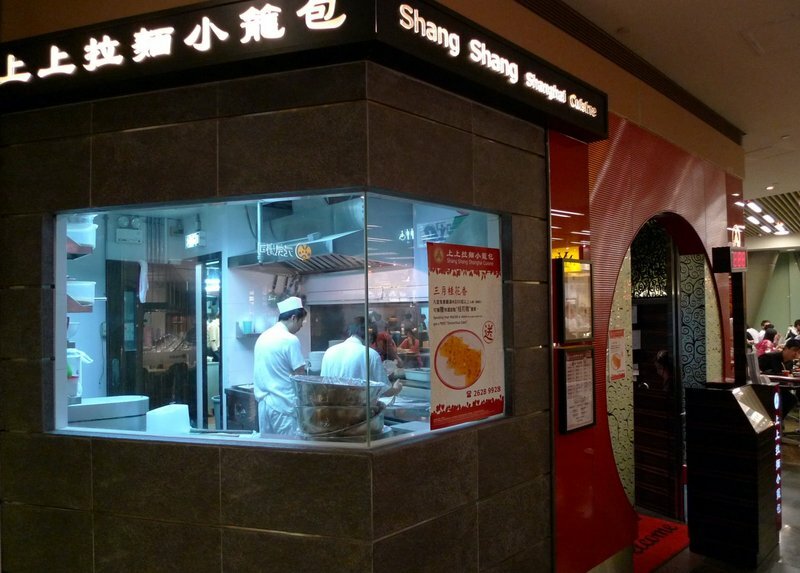 After Tawn completed yoga one evening, Big Michael suggested we try Shang Shang, a Shanghai Cuisine located on the fourth floor of Langham Place. There is actually a very decent food court there, both with sit-down restaurants as well as the typical food court take-away places. Shang Shang is a bright and modern restaurant with attentive waiters and a reasonable price. Oh, and tasty food, too! 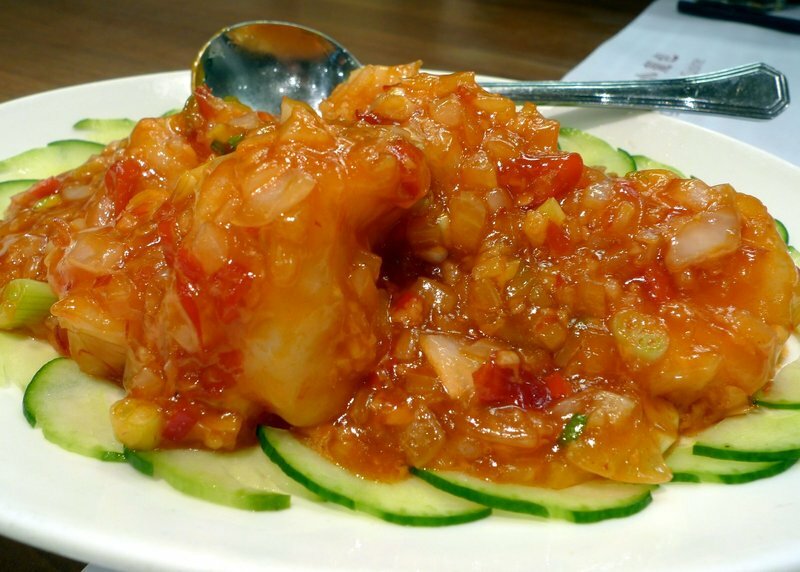 Fried prawns with spicy sauce. Delicious and not as spicy as you might expect. 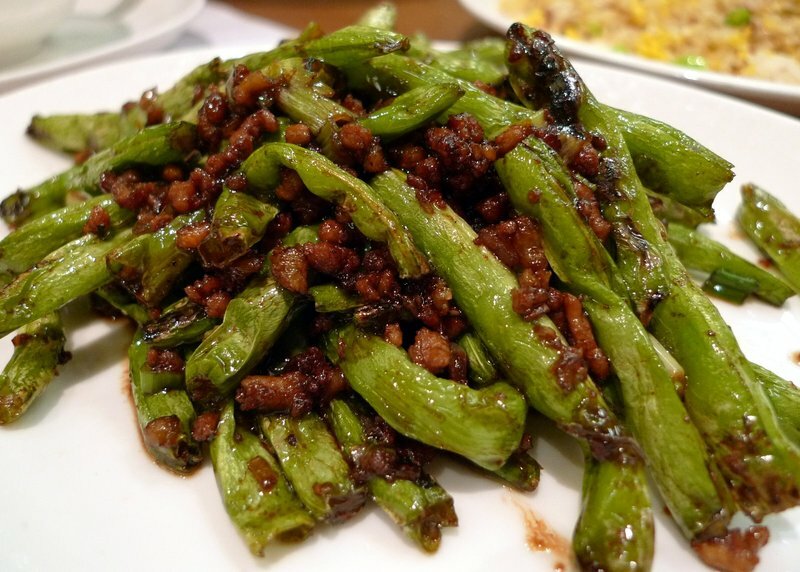 Braised string beans with minced pork – always a favorite of mine! 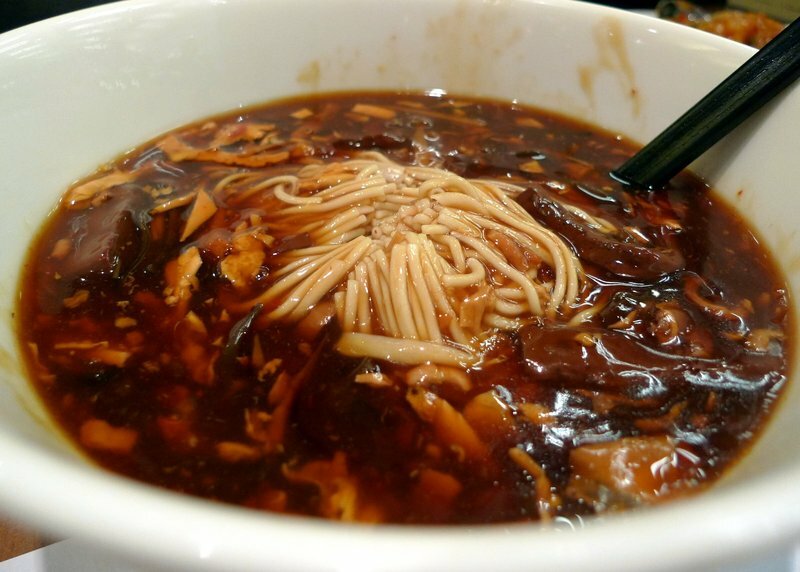 “La Mian” noodle in spicy and sour soup. 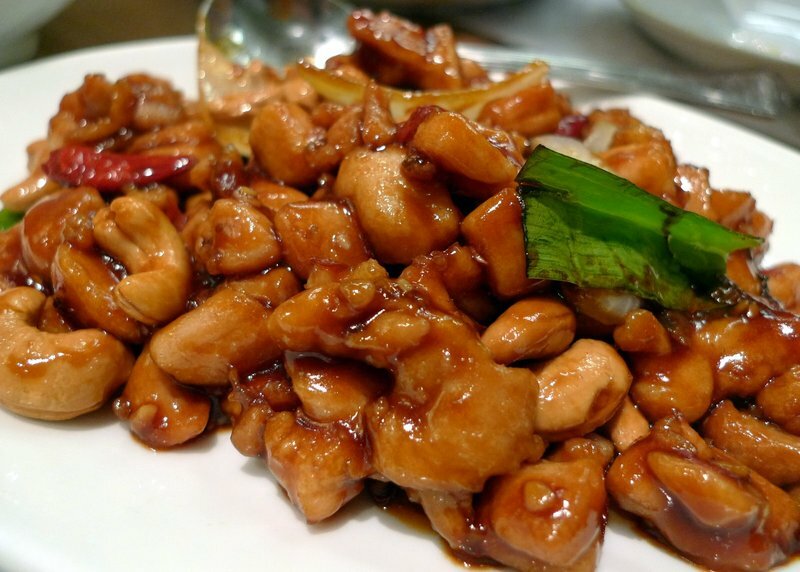 Sauteed chicken in spicy sauce with cashew nuts. 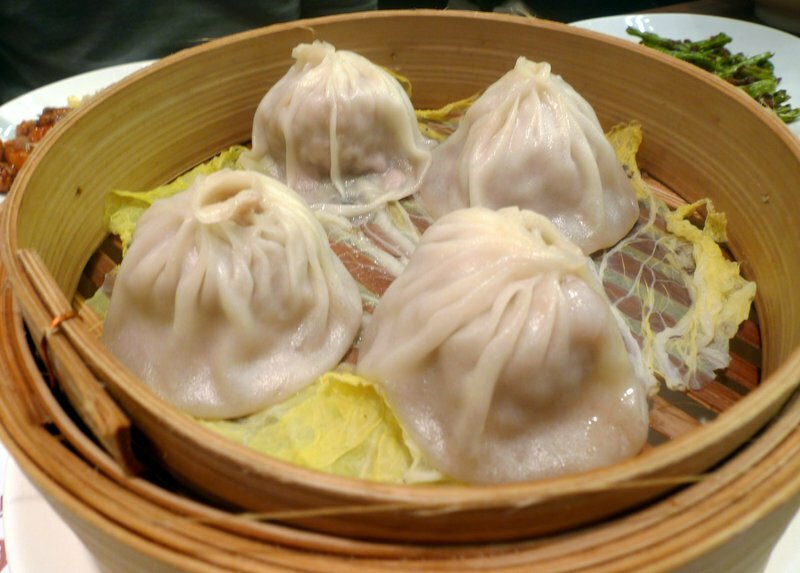 Shanghai style steamed pork dumplings – the Xiao Long Bau that we enjoyed so much in Taipei. 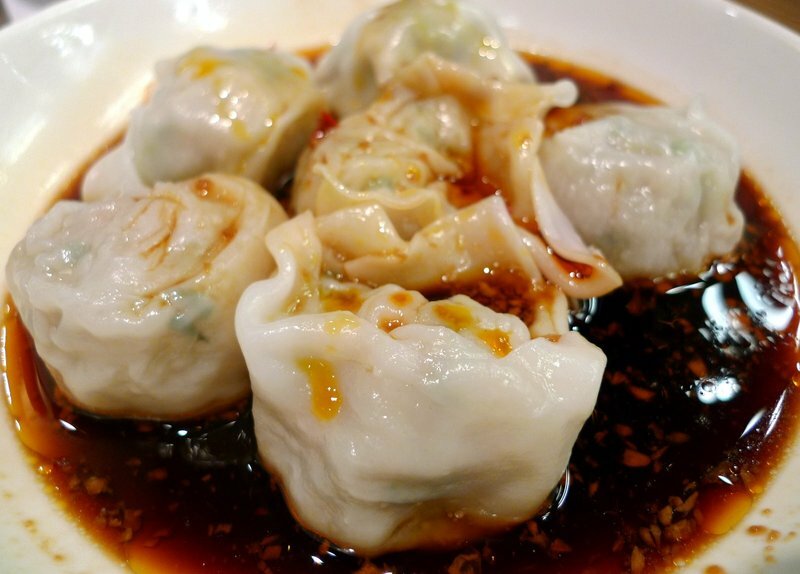 Wontons in hot chili sauce. Again, similar to a dish we had at Din Tai Fung in Taipei while there with Andy and Sugi last November. 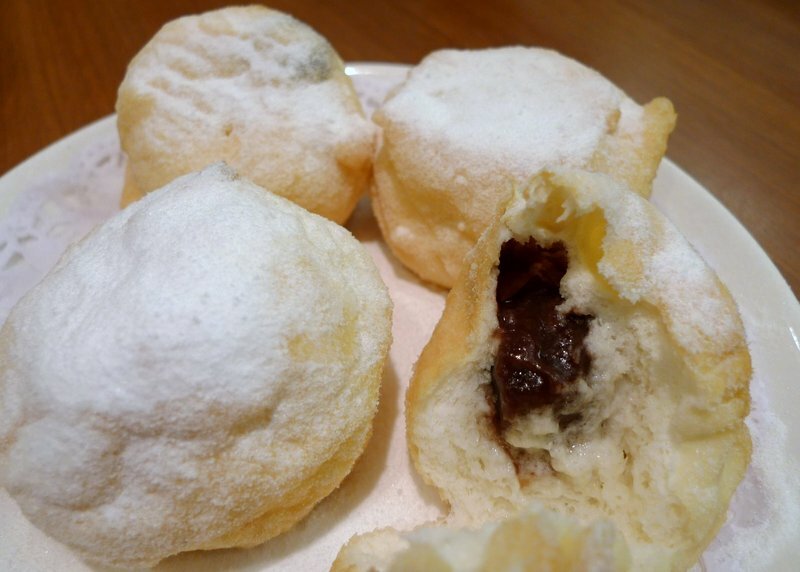 For dessert, a feather-light bun filled with black bean paste. Almost felt like meringue, the dough was so light. 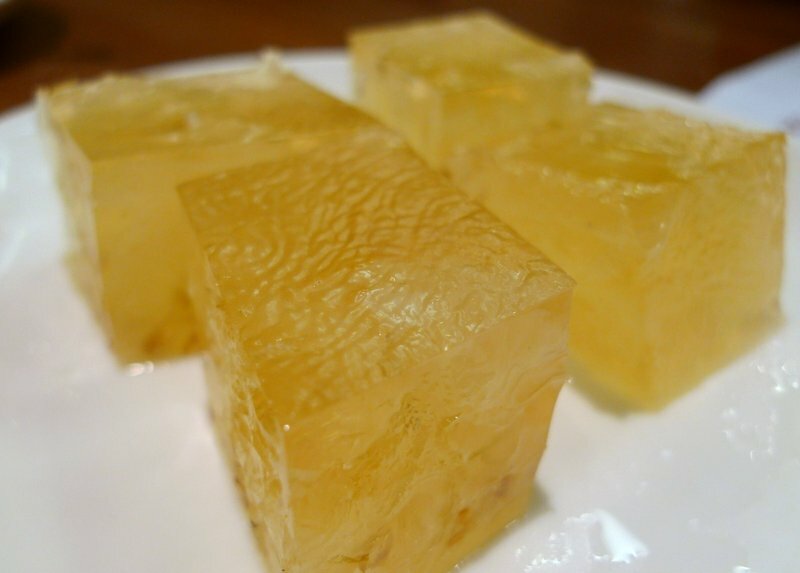 A gelatine dessert made from an aromatic flower similar to chrysanthemum. I didn’t catch the name. This is made with rock sugar and agar agar (which is made from seaweed). Above, Michael serves the noodles to Tawn. All in all, this was a really tasty restaurant. 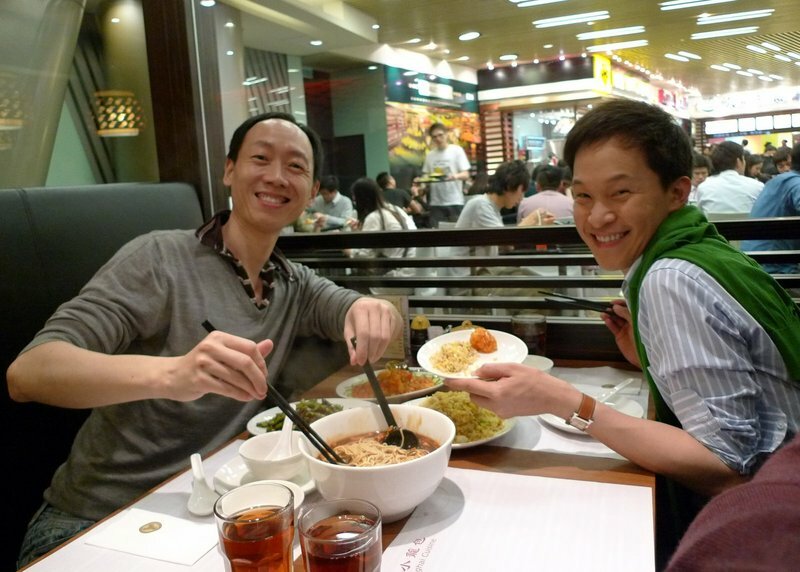 Total price for three persons was HK$400 – about US$51. Worth a visit. This entry was posted in Uncategorized and tagged Dining, food, hong kong, Kowloon, shang shang, Shanghai, travel by christao408. Bookmark the permalink. Great pics…. you have me drooling, now! A few of the dishes, fried rice, dumplings reminds me of Ding Tai Fung! So delicious of course! Time flies when you guys are having fun, right? I am gaining weight and enjoy it very much reading your food blogs. I’ve actually been to this restaurant too. I loved the food there. Makes me wish I was back in Hong Kong again. I am not sure if these were even Shanghainese…but they sure look good.But heck, who am I to judge…the dumpling in chili sauce is actually called hong you chao shou, literally means red oil stir hand. It’s actually from Szechuan, that much I am sure of.La Mian just means hand pulled noodle. More!!! =) Great entries–I will try to hit these places when we go (and all so convenient to our hotel since we’re staying in Mongkok!). Man, I’m HUNGRY! 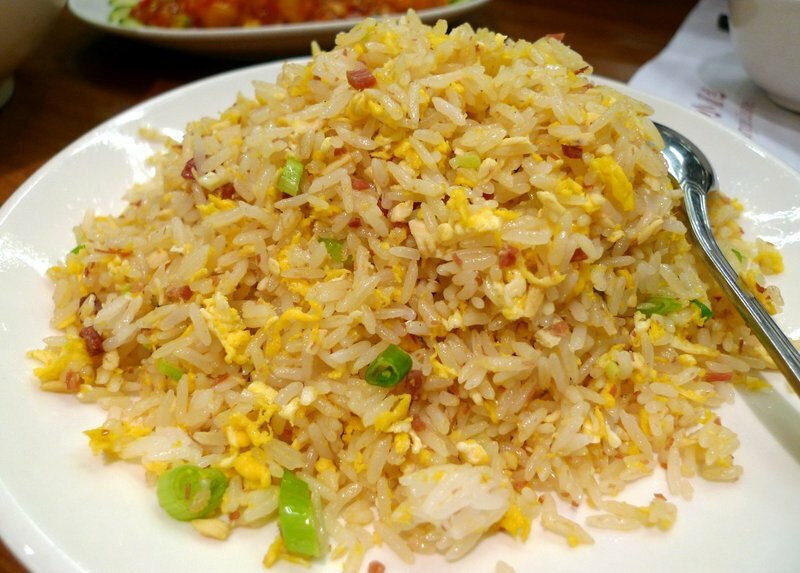 Mmm… the fried rice looks good. I could use some of those wontons too. I really shouldn’t have clicked on this just before heading to bed. I may have to raid the fridge! About films, why not watch the film “Echoes of the Rainbow” that is now showing at all major movie theaters in Hong Kong. Because a lot of scences of this award-winning film were shot in Wing Lee Street, the street is going to be preserved. Watch the film and then go to Wing Lee Street (on Hong Kong Island, five minute walk from Central Market) to watch the old style archetecture there. looks delicious, as always! maybe you should get a job as a food photographer ;)i’m curious about the gelatin dessert… i’ve used agar agar before, but not in that fashion. i wonder if i could make it with chrysanthemum (or, if you can remember it, the flower that they used). I love fried rice and that prawn dish looks delicious, though I’m not sure about the ‘spicy’ part. OMG! I am so hungry now! The braised string beans and pork is also one of my favourite dishes! I just need a bowl of that with some white rice! DELISH!!! The fried rice alone looks good! That’s great that Tawn is considering being a Yoga Instructor. I just recently took on Bikram Yoga – and am loving it. haha Portland street…. some of my school mates used to hang around there after school….wonder what they were looking for….? @agmhkg – Trouble, perhaps? =D@waiszeblogs – He has a lot of passion for it. I’m encouraging him to find one of those week-long retreats where he can explore it more deeply. @brooklyn2028 – The beans are one of my favorites, too. Something about the charred flavor from the braise is really satisfying. @Chatamanda – Interestingly, I didn’t find it particularly spicy. Just more of a mild note than anything else. I knew I should have stopped and eaten dinner! I should have listened to myself. The food looks delightful. I am curious- was the agar agar dessert jiggly or firm? @murisopsis – Pretty firm with only the slightest jiggle.